Quality hair care keeps your bridesmaids’ hair looking great. If you are planning your wedding, your top priority is making sure you look amazing on your special day. It goes without saying you and your groom will be the stars of the show. However, all leading ladies have supporting casts, and in this case, you’ve got your bridesmaids. They won’t hold a candle to you, of course, but you do want to make sure they shine in their own rights as they take a supporting role in your special day. Here’s the good news: with quality hair care products, including high-end hair extensions, your bridesmaids can look amazing without breaking the bank. Hair extensions can help all of your bridesmaids achieve great looks. 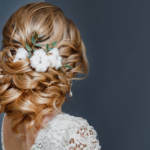 Thanks to natural-looking, versatile and easy-to-use hair extensions, even your bridesmaids with shorter hair can pull off this timeless look. With a bit of practice, perfecting this style is simple. 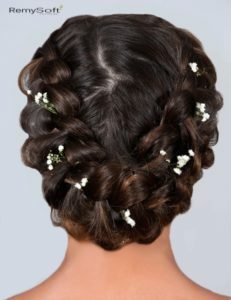 From the crown of the head to the middle of the hair, create a French braid and then secure it. Then, from the middle of the head to the ends, braid about three quarters of the remaining hair. Pin that section with rhinestone or pearl pins, and let the remaining one quarter of hair flow naturally down into a soft wave. A French twist is lovely and elegant. Double it, and you’ve got a wedding-worthy special-occasion look for your bridesmaids. Here is how to get the look: create a mini pompadour toward the front crown of the hair. Roll one side of the hair toward the crown and pin it, then repeat on the other side. Secure both twists with decorative pins or even faux flowers that complement your bridesmaids’ dresses. Hair products for remy hair are ideal for producing wedding hairstyles. This hairstyle combines two classics: the chignon and the French braid. It may sound daunting, but with patience and practice, your bridesmaids can recreate this look. First, hair should be parted to one side and that side should be French braided and then secured. Next, repeat the same steps on the other side of the head. 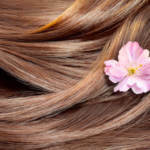 Hair in the center back of the scalp that is not swept up into a braid should be lightly combed to add volume. Finally, take the loose hair, roll it into a classic chignon, twist and secure. Voila! A classic long-hair bridesmaid look. Hair extensions are a great way to stand out and elevate your look during special occasions. Your bridesmaids will love experimenting with these looks and the versatility of hair extensions. In fact, if they have never worked with extensions before, don’t be surprised if they become hooked and opt to make them a regular part of their looks. Are you wondering how you can possibly thank your devoted bridesmaids for helping you pull off your special wedding day? How about surprising them with an assortment of hair products for Remy hair? That is a gift they’ll truly appreciate! Contact us and we’ll help you put together the perfect thank-you gift!